A happy customer with her peace sign messenger bag! I'm so pleased to share this great picture of a recent customer. This is Gwen and her new peace sign Lynx Deluxe Messenger Bag! custom made tarot card messenger bag and feedback! Need something special for yourself, or a gift for a family member? I work on custom orders all week long, contact me and I am happy to help you too! Is my messenger bag in the movie Premium Rush? 2 years ago this messenger bag was purchased from me to be used in the set dressing for a movie. That movie, Premium Rush, opens August 24th 2012. If anyone is going to the movie, please keep an eye out for it and let me know if you see it! 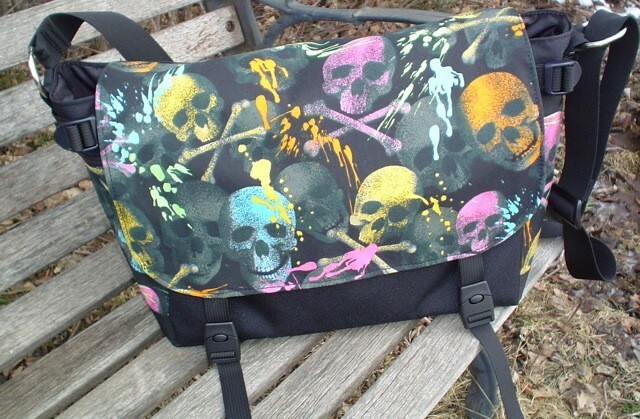 Back to school tie dye peace sign messenger bags! Here are the new bags in the shop now. Custom orders are always welcome, so you can get just what you are looking for!